Immagica by K.A. Last is a story all of a piece with those such as Alice in Wonderland, The Chronicles of Narnia, Inkheart, The Neverending Story, and Labyrinth. It is the story of Rosaline, a young girl whose family houses unimaginable secrets, both dark and light-hearted. 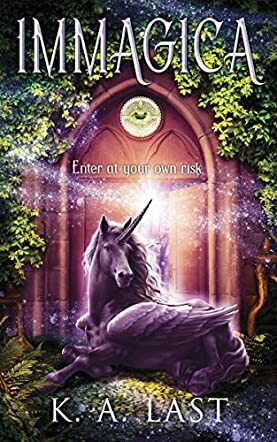 On her fifteenth birthday, Rosaline learns she has an uncle she never knew about, she’s not who she thinks she is, and her family is guardian to a wondrous realm known as Immagica. It’s in danger of disappearing, and it's up to Rosaline to set things right. For her birthday, her father gives her an amulet, a family heirloom, and tells her it is her birthright. He also tells her she must find ‘the book’ hidden in her grandmother's attic. She and her brother Elliot find the book and get drawn into Immagica, though at different places. Searching for her brother, Rosaline meets a variety of beings, from unicorns and gryphons to dragons and fairies. The hunt for Elliot becomes the quest to save Immagica itself. More family secrets come to light, and Rosaline is faced with some hard choices. I loved the cover. The artwork was beautiful, and it complemented the story. Nothing is quite as off putting as a book cover that doesn't match the book. The chapter headings were creative as well. Though it may be a play on a familiar theme, Last does a wonderful job of breathing fresh life into it, and in weaving Rosaline’s story. If you like books such as the ones mentioned at the beginning, then you are sure to fall in love with the beauty of Immagica.